What is the next level of call, for us? We were invited to go out to nature. I sat quietly in the Dare with my eyes closed and I felt a presense – a soft tinkling around my eyes. I asked who was there – and I was told there were several and that they wanted to guide me to a place on the land where they could speak to me. I said yes. 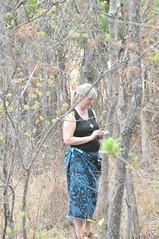 They led me through the woods to a rock and along the way they asked me to pick up a cluster of seeds that were dried. Once at the rock, they invited me to look at the cluster of seeds and then they began to speak to me….. 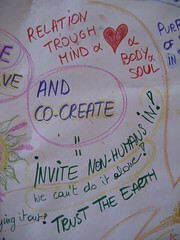 Creating a new civilisation of humanity living in clusters in different zones of a whole, that organise as bees, have flows of currency and people like rivers, exchanging ancient and modern knowledge and practices, taking seeds from one place to the next – weaving one web where the gift of human consciousness allows the Earth and Mystery to be made visible so it can see itself. I’m sitting this Sunday morning at a different spot to write. I don’t need to include notes from flip charts, I’m sitting now at the fire pit which is central in the garden in the village. It is Sunday and you can feel that things are more quite; after all it is weekend. 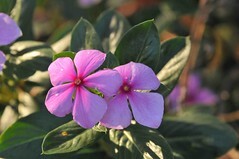 The rains – and power cuts – have been going on and you see the herbs and vegetables recovering and starting a new growing season. Also we, as participants in this gathering, will have some kind of new beginning when we leave tomorrow and head home again. But let me link back with where I left you in the previous posting. After dinner we had organized a gifting circle. 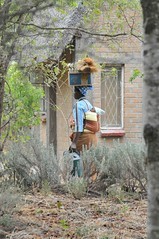 Much stuff is not easily available in Zimbabwe and money is scarce in the village. We had asked the village beforehand for a wish list and many had brought materials for projects, for the children, for the office etc. The fact of doing it all together, at a certain moment with all present made it a true gifting to the village as a whole and it felt better to me than giving it to individuals. 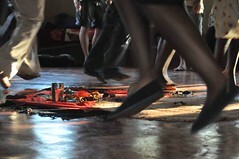 Then followed a true dancing feast! The village had invited a mbira band (using thumb pianos) to celebrate the gifting and we – the Kufundees and all of us loved it! The energy was abundant and I was all sweaty when I walked to our little house where a few of us are staying. Saturday morning was inviting us to probably the same intensity as the night before, but contained in stillness and silence for the whole morning. 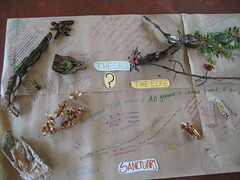 We were guided into our bodies by Sarah and then send out into nature with the question: What is the next level of call? We all spread to be on our own, in deep listening. We were invited to bring something back – something that nature showed, or words and poems that had come up. Still in silence we arranged all our gifts in one big sculpture on the floor. It was amasing the beauty and depth we created together: pens were wrapped in curled seed pods to symbolize the old and the new… dried flowers together with words… traces of sand… lines of connections… impossible for me to describe… amazing beauty from the local nature… wisdom and visions received in this stillness… A proof of what listening can bring! As more and more people settled back in the circle, still in silence, a beautiful music track was played: Terra by the amazing male voices and harmonies of I Muvrini. It was the perfect thing in the right moment. – In the activity of what was going on between Places, Sanctuary, Displaced places, That-what-is-dying and other elements, the Web of Relationships, the Earth and the Nomads were lying on the floor, at the side, not really part of what was happening. A lot of healing and right relationship dynamics needed to happen before attention could go there. – What most surprised me was that Cellular Depth was represented. It spoke about the deep depletion in us and everywhere. She would team up with Ceremony later and the two stayed together till the end. – At some point People-who-want-to-make-a-difference came into the picture, linking with the group of Places and Displaced places. Still things were missing to come to a point of collective relief. Later Community had come in, but had stepped out of the constellation because she didn’t feel needed; and nobody had noticed! Including myself as the constellator/fascilitator! It was only when People-who-want-to-make-a-difference addressed Community and stated “I need you” that things started to change. I think it means that we need time and attention to include our local communities in the work that we do. – Another point that was fascinating was that many, really a lot of elements mentioned that they felt not invited. It was the case for Silence, for Money, Community and more. 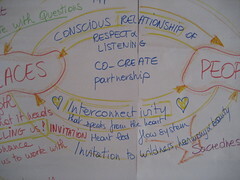 I wonder: Are we not clearly speaking our invitations for help and co-creation? Or are we all waiting for the others to step forward first? Is more courage needed here? I don’t have a clear answer here, but it reminds me of other constellations where the Force or Oneness stated that we could have asked anything from them, but we didn’t do it. – Interestingly Money showed up at a certain point. First she was trying to figure out what was going on. “How can I be of purpose to this nicey, nicey stuff?” In conversation with Places she became a bit interested, but didn’t want to loose her power. At some point she cried because what she saw was so ugly! especially looking at Cellular Depth, the deep depletion everywhere. She finally teamed up with Intention, which felt like a good combination. 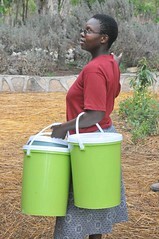 By that time she had expanded into more than Money, more like Resources in general. – An overall observation in the whole unfolding of the constellation was that hardly anyone was aware of all the other elements. And yes, we were many – between 10 and 15 I think – and many dynamics were going on at once, but isn’t that the complexity of life itself and the time we are in? It was only the Witness who called at different times our attention to elements that were not in the focus. For me it was a deep reminder that we need our practices to keep training our witnessing muscle. – As things didn’t unfold quickly I called in missing elements, and at some point Light and Love showed up. Before that the Divine had also appeared. In our conversations afterwards this Light and Love was named as our common purpose, the ultimate thing that is central to our efforts. – More to the end of the constellation People-who-wanted-to-make-a-Difference had find her way to Earth, surrounded by Footprints – Nomads etc., and this relationship Earth – People-who-… was surrounded by many others. People-who-… was crying hard… apologizing… crying more… feeling humble in Earth’s presence. People-who-… finally rested in the lap of What is Dying in the position of a mother giving birth – birthing the new. It was clear that pain needed to be named and shared before that could happen. There was way more in this rich afternoon, and the almost full transcript is available, but I think the main points are here. My original trainer in constellation work said many times that constellations are the rituals of our time, and indeed, it felt like that, at least to me. It is early Saturday morning now. On the small meandering path that I walk every morning to the dare (meaning the classroom or working space) I see how a flower, sprouting from a bulb, grows everyday, unfolding its flower little by little. Also grasses and climbing vines are suddenly covering the earth with a light green mat. Yesterday evening more rains were nurturing the soil, coming with thunder and lightning. Yesterday we were halfway our gathering. We focused on collecting the wisdom that is present in all of us. We had four guests from the organization Tree of Life, which works with victims – and recently also perpetrators – of violence and torture that is so present in Zimbabwean society. They told us that the sharing of stories in the safe environment of a circle connects people back with their family and their community. Through this gathering I understand on a much, much deeper level how we, humans, are so deeply interconnected and interdependent. There is this constant back and forth influencing of people with their family, communities and culture and of people with the places as they live and work there, as much as the landscape is influencing the people and its culture. The Western idea of separateness is an illusion. The welcoming of the visitors and receiving their gifts of wisdom reminded me of the concepts of the nomads that became more visible here. This gathering is ultimately about connecting the places were the people-place relationship is very conscious, but next to the stewards holding and grounding these places there are the nomads who travel between them and bring the gifts of stories and learning and cross pollinate. Bev, the initiator of Tree of Life, offered us a Tai Chi practice as check-in, part of the bodywork they offer in their circles. We then moved into deep storytelling in triads, with a storyteller, a listener and a witness. Tell about a time when connecting with a place brought healing to you. What is the wisdom that stays with you now? The listener teased out deeper levels of the story through purposeful questions; the witness wrote down themes and key points that became apparent. On the spot where I am writing this, the morning sun warms my face and I notice other people around me. Someone journaling on a big granite boulder, someone doing yoga practice behind me, another trying to capture the magnificence of the strange, impressive rock-boulder formation right here in front of me. Through the stories in our little group I became intrigued about the power of regular practice; be it the practice of hospitality in a B&B, the year long practice of karma yoga in an ashram, my own life practice of gardening and creating beauty and abundance… they really do something on an energetic level, way more than what is visible. Practices are, or become, embodied intentions. They leave a deep energetic imprint on ourselves and our surroundings; both on places and on people. 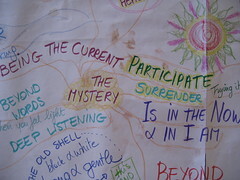 * Sharing stories for reconnection and transformation: to find our own ground again and finding courage; offering the stories in a wider circle so that ground and courage can spread. The sharing and the witnessing by others deepens our own understanding of what the sharing is about. 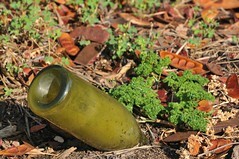 Sharing can also help to ground the places that have seen trauma. * Finding and creating home and community: transforming wasteland in home, reclaiming some grounds, amplifying the present energy; trusting the community and finding each other. If I look at the pile of wisdom nuggets that were shared after this story weaving I would almost give up my harvesting job here! So much! So many different points and levels! It forces me to dive deeper in the model we have build so far and expand it. 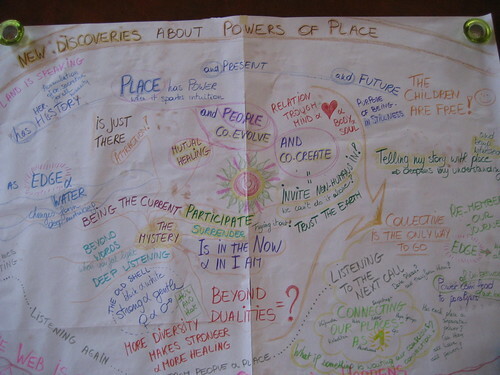 Besides the harvest of the morning, there is also a big mind map that came out of the afternoon circle around the question of what were our new discoveries so far around Powers of Place? I will try to speak it in one overview. 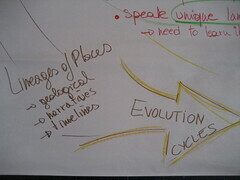 I think that at the center is the awareness that people and places co-evolve. I have said it before in other words, but there isn’t actually any separation, except in our logic mind that can see two different ‘things’, but we are stating here that the relation is crucial and essential. There is no escape from it. In this co-evolution it seems that places are witnesses of what happens in this relation and store the energy of it, but also invite and call us. The people side of this co-evolution is that we relate and co-create (or not) and thus leave an imprint with our actions, both manifest and energetically. •	A place is not just land, rocks, forests or cities, also water can be a place. It actually is a huge part of our earth! •	Places are. They are just there. Which is part of their attraction. We could say that places have an inner stillness in them. •	Places are inviting and calling us to ground and balance, on many levels, from individual to global and everything in between. •	Places offer support, proportion and perspective. Probably because they just are, and are part of our huge holding ground, the earth itself. •	Places can support our choices toward more balance and harmony. They can help us in finding out who we really are. •	The invitation from the land or a place can be very powerful. •	Places have history, biography and are part of many lineages: geological, cultural, narratives, timelines… They are the imprint left by the actions and intentions of the humans. On the people side of the co-evolution it is the quality of our relating that defines the imprint we leave and if we amplify or harm the quality of grounding and balance. At the heart of our relating I see that we need to be mindful and to listen deeply. Being mindful refers to the history and the imprint left, the presence of animals and plants, the influence of unseen energies and co-creative forces. •	Conscious relating – like a bonding that we do amongst humans, including mind, heart, body and soul – restores and heals, brings back the harmony and balance. 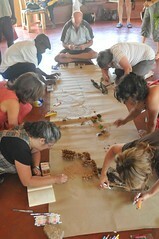 •	Relating collectively with a place and its call – in a conscious way – amplifies growth for both people and the place. •	One way of relating is by living in questions. The answers will come from the place. 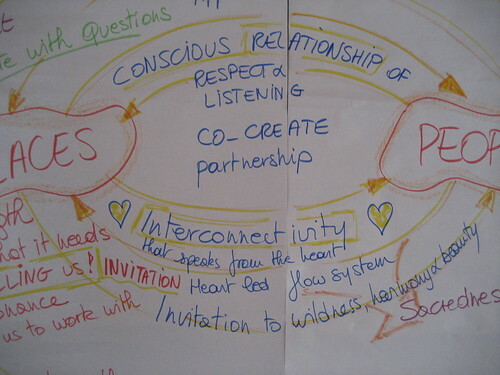 •	We can relate as stewards – people listening to a specific place and its call and showing up to ground and manifest it – or as nomads – people travelling to different places and cross-pollinate between them. •	Relating with place means also to invite the non-humans into the co-creation, because we can’t heal the distortion we have created alone. 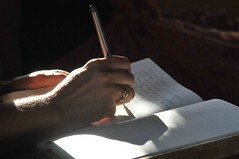 I have been thinking, sensing and writing now the whole morning. Other people from the hosting team have arrived to prepare the space. 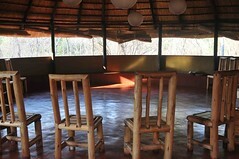 One practice that has been consciously done in our days is creating a beautiful center with natural materials. 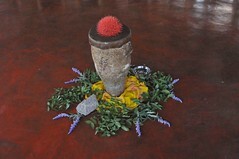 Right now is appearing symbols for the four directions: a rock, a candle, a bowl of water, a small twig with leaves and a curved seed pod hanging on another twig, swirling in the wind. 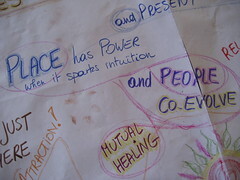 We talked yesterday of the mutual healing that happens when we listen and pay attention to the people-place relationship. Many words and concepts came up that come closer to Mystery, the Now, the I am. What if we connect our places and see them as one? What if something is waiting our conscious connection? 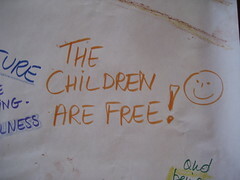 The future we want is when we see the children smile and being free. Mornings are long here and evenings are rather short. By 5.30 am the sun has already come up and some people gather around the fire pit to tell their dreams at 6am. 6.30am starts both Aikido or yoga or any other morning practice people are inclined to do. This morning (Thursday) some did a half hour walk to the river to get a swim, walking back to join breakfast at 8am. From 9am till 10am we keep our places clean and beautiful and help out in the kitchen and other work that needs to be done to keep the community and the many visitors going. Fetching fire wood is one of them, as all cooking here happens on specially constructed fire pits that prevent loss of heat, as happens in an open fire. Listen to what has heart and meaning. Tell the truth, without blaming or judgment. Be open to outcome, whatever emerges. That was a good way into the World Café, a methodology used to create common ground between people who hold a common issue or topic and to let the collective intelligence and wisdom of a group emerge by cross pollinating many intimate conversations between small groups. … intelligences emerges as a system connects with itself in diverse and creative ways? … compelling questions encourage collective learning? … we already have all the resources and wisdom we need? 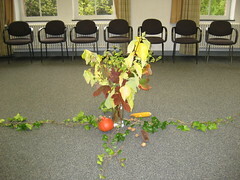 Glenna guided us beautifully through the three rounds of conversation and Maria chimed in to lead a collective harvest. 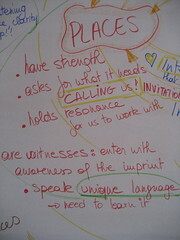 Each little group of four was invited to write down the main features, characteristics of the powers of place. All these were clustered then, which got us to some ten important points. I tried to capture all this wisdom into one map or overview. Central to me is this reciprocal relationship between People and Places. The question of what came first or what is first is not appropriate. People and place, humanity and earth has evolved together and will continue to do so. They shaped each other over time, through many cycles, back and forth. We are now in a time where this relationship can be conscious on many levels and be collectively held among continents. There were many stories of all things we receive when being in nature. It brings us guidance, gives strength and asks us to wake up! I was struck by what Yitzak said: places are witnesses. They incorporate what people do, either positive or negative and hold that energy over time. People leave an imprint on the land. Later on we can benefit from this stored memory, or we need to be aware of what is there and maybe relate with he pain and grief held by the land from history. From the stories told here we can say that places are inviting or calling us. Many people present here have felt it that way and responded to it, not exactly sure where the journey would lead to. So, in this awareness of interconnectivity between people and places the qualities of deep listening and being mindful seem to be crucial. If places are witnesses, people can relate with respect. If places are calling us, then people can listen, respond and co-create. As much as being in nature puts us in contact with the sacredness of life, entering into conscious relationship with any place – natural or human build – leads us back to sacredness, through a heart led system of flow. This conscious relationship with the place we live in gives us back the experiences of being rooted, of being at home, of belonging. Not just to this particular place, but to the Earth itself, the home of Humanity and so many other beings – physical and intangible. 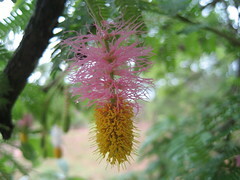 Entering into a conscious relationship was named as being appreciative of the feminine energy. And the qualities we relate with grandmothers – the listening, the not-judging, the blessing of the new children – seem to be crucial here. When we engage in this way we can sense what are the life-affirming actions that will heal the place or will enhance its inherent qualities. 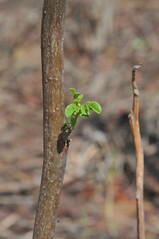 It will bring us into next levels of wholeness, whatever that might be or look like. The unnamed essence, the mystery stays beneath it all. After long deliberation the hosting team had decided to use Open Space Technology for the afternoon, to give opportunity to dive deeper into the practices we have invented, adapted and embodied over time to give form to this relationship between ourselves and the land we co-create with. I think there were 7 sessions offered, and with the practices came more stories and more questions; on all levels of co-creation and partnership with land and places we find ourselves in. 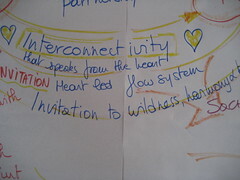 In this partnership we need to span many levels – from the very concrete of how to deal with water scarcity when there is no electricity or other energy to pump the water – over how we balance masculine and feminine energies and how we learn, study and sense the many different lineages of a place – to how we can live in the mystery of life and evolution itself. As somebody said: synchronicity can happen every time; not just now and then. 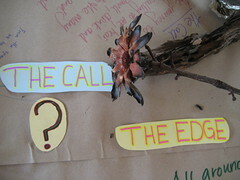 It links with the session I hosted around calling: Who is calling when we feel called? Deep listening can lead to take a step in an unknown journey. It can hold long times of not knowing, where we (our ego’s) are not in control, but sometimes we get some signals and then some magic can happen. My stomach tells me it is time for breakfast. I have been writing here in the silence of the empty circular classroom – the dare – with open walls almost all around. Sheltered and so connected with the trees around and the huge granite boulders in the most amasing and impossible shapes and structures. I feel blessed for another day to live in the mystery of life on earth. 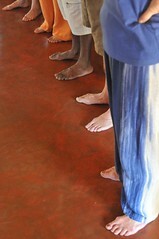 Wednesday morning was a welcoming in the many facets and projects that Kufunda has. It was really a guided tour from one project to the other. 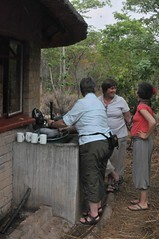 Our little group was guided by Fidelis, one of the Kufundees from early on and another one by Jackie. Fidelis kept us within the timing even when we had way more questions and everywhere there was more to tell. It seemed to me that the daily village practice of doing Aikido has taught him very well to get out his sword! 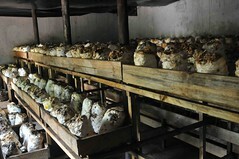 I will just name the different projects: mushroom growing – yammy!! – herb and food lab; permaculture garden; making bokens (wooden Aikido swords); the administration, communication and accounts; beekeeping; running the retreat center; solar energy and water harvesting. Besides that the knowledge and the reach out of each project was really impressive, most amazing is to see how the principle of permaculture – to diversify – is present in that people join always in more than one project and that the village itself didn’t bet on one ‘mono-culture’. Another principle is that they really believe – and show! – in: Doing with what you have. They build with local materials available, they use the knowledge and skills present, they don’t ask for help from the outside but they seek to co-create with many partners. This brought for me an answer to my question of right relationship. Sometimes what I can offer in the co-creation is money or second hand materials and sometimes it is my experience or my listening ear. Being on this tour, and seeing what these young people realized in such a little time under the most difficult circumstances taught me a lot about what is possible when we connect in a local community in relationship with the place we are in. The tour was completed by the story of how Kufunda came into being and the different waves of activities with the surrounding communities. As we gathered in circle in the afternoon in the classroom – the learning space or dare – it started to rain with thunder in the air. Finally the circle was complete with the last arrivals from Germany and Kenia finally here! 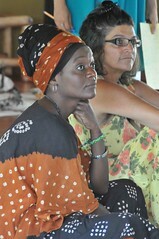 This gathering has been a journey with many beginnings… like Kufunda, like Axladitsa, like maybe all of our projects? What does it mean to live in this time now? It is time to be present to one another. It is time to connect. It is the right timing to come together. With the rain comes wind… and cool air… the permaculture garden here, in the middle of the village, needs this water very much after a long period of dry weather. The rain, wind and the sound of the thunder forced us to come closer in the circle. 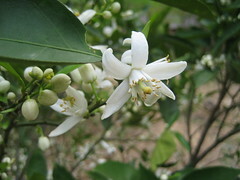 It is the beginning of the rain season here, and it seems like a good omen. Later, also the electricity came back on. Many themes surfaced in this long circle. What was most present for myself was the sacredness of the ordinary. Sacredness is a perspective we can have on everything, from the most mundane and most routine chores to any kind of spiritual practices and all the way to the most technological innovation. … more than bridging it can become a synergy of people and places, of humanity and earth. Maybe we can create wholeness in the end? The next five days we are here in this incredible village that is hosting us. We will share our stories of how our places have come into being or are starting up. We will share our experience of our relationship with place, how Earth is guiding us. We will share our practices, how this relationship takes shape in what we do and how we do it. In how we relate with food, with energy, with each other, with ritual, with… how we use what Earth provides us and how we give back. After all this sharing we will illuminate more of this field of practice so that others can stand on our shoulders and learn form our experiences. We will also look into creating a web of people and places to continue our inquiry later after we are back home. This story has many threads. One is the story of people who – at some point in time – felt the calling to create places of learning, places of community to take care of the Earth, because we need to do that to take care of ourselves, as humans being. 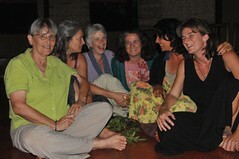 It is the story of people and places: Glenna and Paceo del Ojo in New Mexico – US, Suzanne and Hope Springs in Ohio – US, Maria and Sarah and Axladitsa in Greece, Marianne and Kufunda in Zimbabwe, Anabel and Gilean and Hazelwood House in England and Patricia and NAPS in Brasil and more that are not present here or that we even don’t know right now. But all these people did it separately, not knowing about each other. Some of these people and their places were in the Berkana Exchange where some initial weaving took place. It feels time now to find one another. It is time to come together, it is a time of unity. The second thread is through a woman, Sheryl Erickson, who had started the Collective Wisdom Initiative. In this initiative they found out that there is something that supports collective wisdom that comes from the powers of the place. It comes form the land, it comes from the invisible… and many times forgotten in the industrialized world. Because of her interest in this she looked for funding and created the Powers of Place Initiative. Originally it was an inquiry to understand Where are these places? Who are these people who started them? But more and more it has become an inquiry about: What is the relationship between people and place? A knowing we have forgotten in the West, but many indigenous people still know! On one of the many conference calls of this initiative it was Suzanne who said: “Hearing your voices is not enough. I want to meet you in person!” This was echoed by Glenna and Maria’s heart jumped up, as she had been waiting to hear this invitation from the field. As this news was send out by email, Jackie responded with an invitation to hold the gathering in Kufunda. Africa, of course! It was an invitation from the land itself, spoken through Jackie. The land choose us. So the calling team consisted of four places and six persons: Glenna and Ojo, Suzanne and Hope Springs, Maria and Sarah and Axladitsa, Jackie and Kufunda and Ria from Belgium. Invitations were written and many wanted to come. Not all had the money to pay for travel and accommodation and invitations were send out for financial support… again and again… We received some support from the Powers of Place Initiative and from many individuals. We are not alone in this circle as many are at our backs. A few who wanted to come were refused their visas: Kamyar form Iran and the family of Anita, Niten and Sakhi from India. We try to stay in touch with all of them via internet and texting – as electricity allows us. It is Wednesday morning now and yesterday at 4pm we had the official opening of our gathering. All Kufundees – the people who are committed to the Learning Village – and the young Kufundees – the youth being part of a year long youth program – were present to welcome us to the place. And what a welcome it was!!! Singing, drumming and dancing! And more! And more! With the power of their voice and the power of their enthousiasm and joy they seduced all of us to get up and dance with them. 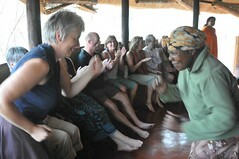 It was a true welcome into the power of this place, Kufunda Learning Village in Zimbabwe. 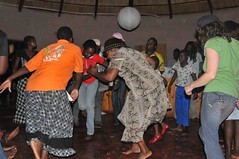 After this abundance of energy and then some soft music on the mbira’s (thumb piano’s) Auntie Emma – who had joined in the dancing, even with her 70+ years – invited the spirits to connect us, visible and invisible beings, and to welcome our gathering and set the intention that we could live like a real family together. Walking this morning to the big metal container to get some water for our morning toilet I realized how far we are removed in the West from what it actually takes to have these commodities of water and energy. And it isn’t just a nuisance. It connects us back with what is real, with the true costs of all what we take for granted. Also it slows us down, which I think is really an advantage. It reminds me of being in Axladitsa in Greece where it was such a powerful practice to keep track – daily – of how much water we used, and how seeing the figures on the board had an immediate effect of using less. I also see some pictures in my mind of Paseo del Oyo in New Mexico of all the efforts needed to get building material across the river when the road vanishes in spring because the water comes down after the winter. There is way too much we take for granted in the West and which separates us from earth and its limits. In this widened circle we ended with offering our names and the places we came from together with a movement, all mirrored back by the whole circle. It was a powerful beginning and now the evening was open to get to know each other more. 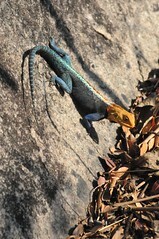 Beginning of November I was in Africa, Zimbabwe, for what came to be known as the Kufunda Gathering. It was called by six people and four places, with some support of the Powers of Place Initiative. This post is the first of a series that will cover the whole gathering, so enjoy the full story over the following days! 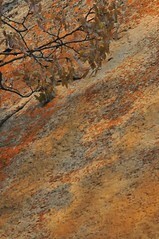 A landscape of big boulders in a kind of forest. Not like any Belgian forest that I know, but small trees scattered all over the place with some leafs unfamiliar to me and even scattered with some cacti. 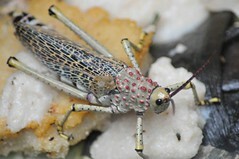 What is sure, the bugs, spiders, beetles and so on are surely bigger and totally unfamiliar to me. 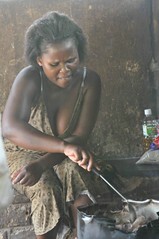 I arrived here, at Kufunda Learning Village, close to Harare in Zimbabwe, now one and a half day ago. It is a place of peace, of beauty, of learning in a society that still has huge challenges on many, many levels. I was here almost 4 years ago, to learn more about Art of Hosting, and it is good to notice that many of these young people walk more upright, with more sparkles in the eyes, more sure about who they are and what they can offer. They are teaching in neighboring communities the knowledge they gained themselves through doing and learning. Yesterday, the calling and hosting team of this gathering met for the first time face-to-face. Some of us only knew each others voices, but the resonance – the feeling to be on the same wave length – and the trust was high enough to call this gathering. Early in our conference calls it was clear that it needed to happen ‘outside the US’. Soon came the invitation from Jackie to gather in Kufunda. We followed that invitation. Extending invitations and following invitations seems like an important pattern in how we became a group of almost 40 people, and how most of us live and work. As I said, yesterday morning the 6 of us – all women – sat together in the morning hours for a deep check in and we invited other participants, who also arrived early, to join the circle in the afternoon to share the stories of what called them to be here. There was a long silence before anyone picked up the talking piece and I sensed how the holding capacity widened and deepened; both the capacity to hold stories, diversity, conflict and pain, as also the capacity to be like an empty tube and listen to the intangible, the land and the wisdom to be uncovered. Later in the day we would look for patterns or themes – and outliners – in all what was said. One of them was about ritual or ceremony; how it is an experience that doesn’t get lost, and that we can spread when back home, wherever that is. The quality of attention we have for the people here, the place and each other has almost this ritual quality. I think it has to do with both realising the bigger picture we are all in – how can humanity find its right relationship with the earth again? – and the translation of this on the smaller scale of here and now: how are we, as Western people in right relationship here with this community, this Learning Village that is hosting us over the next five days? How can it – the give and take – be healing for both parties? Maybe that is the question? This is a blog post – In Dutch – from a few weeks ago, first published on the Dutch blog Levend Vlaanderen. Het ging dus vrij vlot in de voorbereiding, hoewel we pas aan het eind van de zomervakantie op dreef kwamen en het effe duurde voor iedereen een overzicht had van wie en wat in het Vlaamse transitiewereldje. Het was een beetje spannend toen we begonnen met uitnodigen, maar de eerste 8 à 9 mensen waren er vlug. Inschrijvingen bleven binnen druppelen tot de laatste dag. Uiteindelijk zaten we met 34 in de kring. Het was voor ons duidelijk dat Erik zou openen omdat het zijn passie en zijn verlangen was om al deze mensen samen te brengen. Hij gaf het kader mee van zowel de spelers in het Vlaamse transitieveld als van Art of Hosting, in zijn eigen vertellende stijl. We waren vertrokken! Dan een kennismaking: zowel met elkaar als met de vier kwadranten (bouwend op Ken Wilber) die altijd en overal tegelijk aanwezig zijn. ’t Was tof om er op deze manier – letterlijk – in te stappen en nieuwe mensen te leren kennen. Rik en Ivo hadden er hun werk van gemaakt en het nuttige aan het aangename gepaard. Fascinerend ook om te zien dat er een vrij gelijke verdeling van mensen was verspreid over het hele veld; èn heel wat mannen in het van van Ik-Innerlijk! Trouwens dat was ons al opgevallen van in het begin: veel meer mannen dan vrouwen onder de deelnemers; net andersom dan in de vorige Open Leerdag rond Participatie. Dan was het tijd om het diepere en ruimere gesprek te openen om te kunnen starten vanuit een gezamenlijke basis. World Café is hiervoor een zeer geschikt instrument. De techniek en de principes zijn helemaal in lijn met de wereldvisie van levende systemen. Het brengt ons – door het wisselen van gesprekspartners doorheen de drie rondes – in een soort van chaos. In ieder geval is voor even het overzicht op het geheel kwijt, maar de minimale structuur die ook de dingen weer samenbrengt, biedt de kans dat er iets wezenlijk nieuws ontstaat. Het chaordische (op de grens tussen chaos en orde) laat ruimte voor een grote diversiteit, brengt ons vaak in een weerstand of een ‘kreukzone’, maar dan kan de emergentie zijn werk doen. Dan kunnen we van een Groots Gemene Deler –die altijd klein is – naar het Kleinst Gemeen Veelvoud – wat dus groter is én alles omvat. Julie had het allemaal mooi uitgetekend de dag voordien en loodste iedereen hierdoor. Ze benadrukte nogmaals dat dialoog pas lukt als we het gevecht, de discussie achterwege laten, maar denken in “én – én”, diep luisteren en de verschillende draadjes door mekaar weven. zelforganisatie kan bevorderen. Ruimte waar passie, verantwoordelijkheid, initiatief en engagement optimaal tot hun recht kunnen komen. Het leuke vond ik dat het belang van goede vragen werd onderkend. Dat is inderdaad iets waar elke hosting team – van eender welk project of initiatief – veel tijd aan besteed. Het is één van de pijlers van hosting, en ook wat het vaak verschillend maakt van begeleiding (of faciliteren). Hosts zijn geen experten in antwoorden, maar verstaan de kunst om (grote) groepen van mensen door ‘conversations that matter’ in betekenisvolle dialoog te laten evolueren tot het opnemen van initiatief en zinvolle actie. De vraag/vragen waarrond je mensen laat praten, en hoe de vraag is geformuleerd maakt of kraakt zo’n dialoog, omdat het een smal of ruim kader biedt, al of niet beperkende vooronderstellingen aan het licht brengt. In het oogsten van het proces van het World Café – niet het oogsten van de inhoud dus – was een opmerkelijk moment. In het vuur van zo veel goede ideeën en veel gepraat stelde één tafeltje voor om 1 minuut stilte toe te laten. Wat we prompt deden en velen van ons weer/meer in ons lichaam bracht. Het was voor mij een aanduiding dat we misschien te veel in ons programma wilden stoppen… dat we te weinig het eerste principe van Art of Hosting hadden ingebouwd: Wees aanwezig. Ik moet mezelf er altijd aan herinneren dat voor vele mensen aanwezig zijn in hoofd, lichaam en gevoel niet gewoon of evident is… We hadden gerust enkele korten stukjes hier rond kunnen inlassen… volgende keer beter! Voor mij was de stilte voelbaar, niet alleen de afwezigheid van praten, maar wel de collectieve aandacht voor de kwaliteit van stilte en rust… Wat als we die kwaliteit zouden kunnen vasthouden als we gesprekken voeren en de dingen kunnen uitspreken die dan opborrelen, ook al hebben we ze nooit eerder zo gedacht of uitgesproken? Rik nam over en bracht ons weer in een cirkel. ronde sessies van start. Een uurtje later de tweede ronde. Intense gesprekken, iemand rustig op zichzelf… iedereen haar/zijn eigen energie volgend… de wet van de twee voeten: leren of bijdragen, anders weg! Het samenbrengen van de vele sessies is altijd een moeilijke opgave in een kort tijdsbestek. Toch vond ik de korten 1 minuut aankondigingen én de extra tijd voor het gallerijbezoek wel geslaagd. Alleen weer te kort. Ik voelde me als een schooljuf om onze tijdsplanning toch min of meer aan te houden. … we zijn blijkbaar – als beweging/stroming – volwassen geworden en hoeven geen gelijke meer te halen of ons te verdedigen. … de vele perspectieven en experimenten kunnen daardoor naast mekaar bestaan en mekaar bevruchten: de vrucht van diversiteit én het advies: werk nooit alleen! … wat zou goede voeding zijn voor dit mycelium? Het smaakte naar meer en langer. 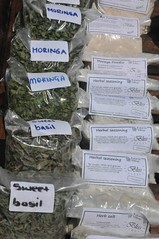 You are currently browsing the Seeds for a happy planet blog archives for November, 2010.